the number of people of pensionable age has increased by 65,500 or 13.5% since 2008. In recent years, we have had a growing population and all of our people interact with public services in some way, often across multiple services. Ireland also has an ageing population, which leads to increased demands on the health and social protection sectors. At the same time, we have the highest birth-rate in Europe; 15.6 per 1,000 population in 2012 compared to an EU average of 10.4. These are issues that must be factored into policy making and service planning in the coming years and which mean that we must plan and deliver our services better. The chart below sets out how the number of public servants has been falling, as the population, and thus the number of service users, has been growing. It is also worth noting that this reduction in staff numbers was not from a particularly high base. An OECD study (Public Administration After New Public Management, 2010) of eight comparable countries showed that Ireland had the third lowest general government employment per 1,000 population in 2006. There are also a number of demographic factors within the Public Service that will inform how it is equipped to meet current and future challenges. For example, the median age of staff in the Civil Service is now 48. While this means that there is a wealth of valuable experience and knowledge in the Public Service, it also necessitates workforce planning to replace public servants as they reach retirement age and an effective approach to knowledge management. New recruits will also bring new ideas and approaches to service planning and delivery. Increasingly, citizens and business customers expect a Public Service that meets their needs. They expect a service that is responsive, flexible, efficient and innovative. 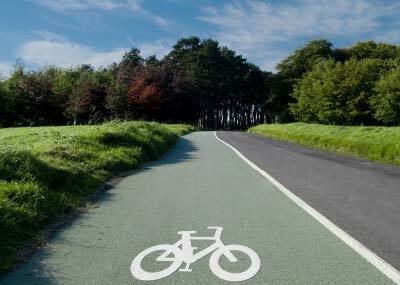 They expect to be able to avail of many services at any time and from any location. In this environment, the Public Service must change how it thinks about the services it provides, how it interacts with service users and how it manages data. The public are not interested in organisational or sectoral boundaries. They see their relationship with the State in terms of services, irrespective of the back-office processes and the organisations involved. They expect the Public Service to be able to tackle complex, interconnected and sometimes conflicting cross-Public Service policy objectives. At the same time, the public expects the Public Service to provide value for money, to be cost-effective, and to be fair, open and accountable. The Irish economy and Irish society has been through a major crisis in recent years. The reputation of the Public Service has been damaged, in common with many other major institutions. Building structures and a more open culture to deliver greater openness, accountability and improved and transparent decision-making are essential to re-building the relationship between the citizen and the State. Citizens must be able to clearly see that the Public Service is working efficiently and fairly in its decision making, in implementing public policy and in delivering public services. In this context, the Government Reform programme is delivering on a suite of reforms in this area, the totality of which, when completed, will strengthen public governance and represent a new environment of clarity and openness in how the administrative and political pillars of the State deliver policy and services. This issue is addressed in Section 2.4 of this Plan. The Programme for Government 2011-2016 provided the backdrop for many of the reforms set out in the Government’s Public Service Reform Plan of November 2011, including cross-cutting, sectoral and political reforms, as well as operational efficiency measures. Progress on the implementation of the Programme for Government is reported on an annual basis, with two reports published to date and a third report due in March 2014. Many commitments have already been delivered in full and there are others where substantial work is underway. Other commitments will take longer to deliver and will be implemented over the lifetime of the Government. As a result of the economic and fiscal crisis, a wide range of measures designed to save almost €30 billion have been implemented. Over two-thirds of these adjustments have related to expenditure. Even as Ireland has exited the troika programme, public expenditure will remain constrained by new EU rules which mean that growth in General Government Expenditure is linked to the potential real growth of the economy and is fixed in line with expenditure ceilings for three years. Expenditure will not be allowed to grow by a rate that is faster than potential economic growth unless compensatory discretionary measures are introduced, for example, through changes to tax policy resulting in increased revenues in a year. This would allow for the Government Expenditure Ceiling to be increased without affecting General Government Balance targets. Gross voted spending has been reduced from its peak of €63.1 billion in 2009 to €54.6 billion in 2013. This represents a reduction of approximately 13.5%. The Government Expenditure limit for 2014 will be €52.9 billion and the expenditure limits for 2015 and 2016 will be €51.5 billion and €51.9 billion respectively. From its peak of €17.5 billion in 2009, the Public Service Pay Bill was reduced to €14.1 billion in 2013. The measures that have been taken to reduce costs have been across all categories of public expenditure and have had a significant impact on the living standards of many citizens of the State, including public servants. Those public servants have made a considerable contribution to delivering on the adjustments required, while at the same time undertaking substantial reforms in the way they deliver services. Public servants have already had two pay reductions, totalling an average of 14%. In addition, those earning over €65,000 have seen a further reduction since July 2013. From its peak of €17.5 billion in 2009, the Public Service Pay Bill was reduced to €14.1 billion in 2013, including the Pension Related Deduction. This is a reduction of almost 17.7 per cent. In addition, the numbers employed in the Public Service have fallen by almost 10 per cent and Public Service pensions have been reduced, saving over €100 million annually. 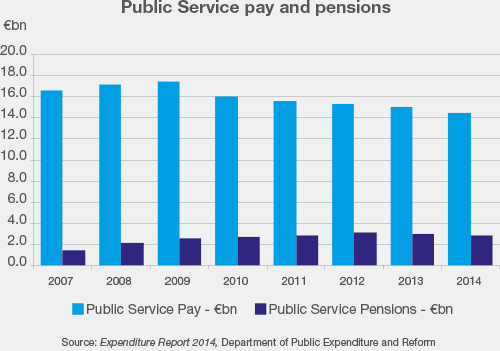 The chart left sets out the reduction in expenditure on Public Service Pay and Pensions from 2007 to 2014 (projected). The Public Service has been undergoing significant change and restructuring over the last number of years, with a view to making it smaller, less expensive and more efficient. Notwithstanding the significant progress made, returning the public finances to a sustainable footing remains a challenge as the State continues to borrow significant amounts to meet our ongoing expenses (€9.6 billion is estimated for 2014). In this context, further far-reaching reform is essential to ensure that public services will be maintained and improved in a leaner and less expensive Public Service. The major interdependencies between the performance of the Public Service and the performance of the economy overall should not be understated. The Public Service has a central role to play in underpinning economic growth by striving to provide a framework for public service provision that enables economic growth. The key lesson to be drawn from the economic, fiscal and banking crisis is that the quality and effectiveness of public governance is integral to the sustainability of long-term economic growth. The performance and reputation of public institutions across the broad spectrum of their responsibilities is a critical factor contributing to Ireland’s competitiveness and the attractiveness of its business environment for investment - both domestic and foreign - and employment creation. In addition, the efficiency with which public services are delivered - through their impact on the cost of their provision, taxation levels and the State’s funding requirements - has a critical role to play in helping to facilitate economic growth. The Haddington Road Agreement came into force on 1 July, 2013. Building on progress made under the Croke Park Agreement which delivered pay and non-pay savings of €1.8 billion, the Haddington Road Agreement will deliver a reduction of a further €1 billion in the Public Service pay and pensions bill by 2016. Critically, the Agreement will continue to provide a framework for widespread industrial peace and stability, ensuring a suitable environment for the delivery of the existing Public Service Reform programme, but also supporting additional reforms agreed as part of Haddington Road. In this context, the Haddington Road Agreement will be a key enabler of Public Service Reform. One of the most important aspects of the Agreement is the opportunity to deliver an unprecedented increase in public service productivity. The various productivity and reform measures when fully implemented will add almost 15 million additional working hours annually, across all sectors of the Public Service, which will deliver significant cost reductions of approximately €430 million. This will be particularly important in light of the ongoing reduction in staff numbers in many areas. In addition to the obvious cost benefits, these hours will provide public service management with the ability to accelerate the reform agenda and to deliver improvements in the services they deliver. Almost 15 million additional working hours annually will be added across all sectors of the Public Service, which will deliver significant cost reductions of approximately €430 million over the lifetime of the Haddington Road Agreement.